Swamplord Musel'ek! A beastmaster hunter so powerful, he can even tame druids in animal form, and make them serve him as his pets! What drove Musel'ek to become such a skilled domesticator of animals, however? Driven into exile by the other Murkblood because he rolled need on everything that dropped, Musel'ek lived a lonely existence, roaming the caverns of the Underbog alone. Unable to love himself, Musel'ek could only seek solace in the unconditional love of his animal friends. When he encountered a strange, talking horned bear wandering the Underbog, Musel'ek assumed it was an amazing rare beast, something on par with all those spirit beasts he'd heard about, and couldn't wait to tame it and have a new friend. Not pictured is his pet, the druid Claw, currently trapped in bear form. nothing that the bible can't fix. At level monks? Damn. I guess that makes Musel'ek less of a boss, and more of just a shouty elite then. Following the death of Archimonde and the end of the Third War, Lord Kazzak served as commander of the Legion forces remaining in Azeroth. Between the occasional visit to Stormwind while chasing meddlesome adventurers, Lord Kazzak was able to reopen the Dark Portal and meet up with the Legion forces stationed in the shattered ruins of the world formally known as Draenor. Leaving his subordinate, Highlord Kruul, in charge, Lord Kazzak passed through the Dark Portal and traveled to Outland, where he got a sweet promotion and became Doom Lord Kazzak. Since then, he's been happy to just hang out on the Throne of Kil'jaeden. Current status: Unknown. Despite his assaults on Stormwind and role in reopening the Dark Portal, no one really seems that interested in chasing after him. Presumably still alive, patiently waiting for the next Burning Legion expansion when he'll get another promotion. 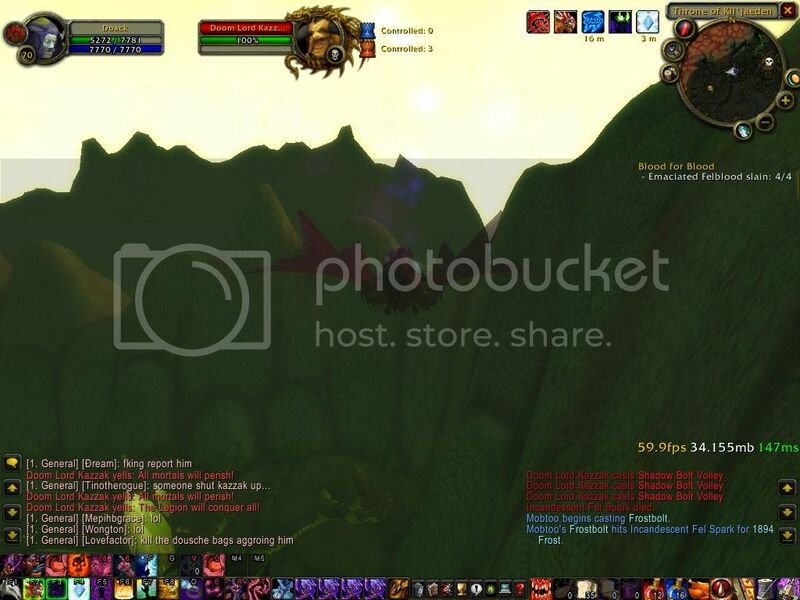 Back when I first leveled through Hellfire Peninsula, people were trying to fight Doom Lord Kazzak all the time, with his taunts echoing throughout the entire region. I assumed that his shouts were just part of the zone, like Fel Reavers. As a result, it felt really weird leveling through there at a later date without him proclaiming our doom at all hours. All hours? Try all seconds. May the legend and his incessant zone-wide shouts be remembered. 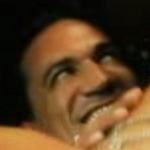 ahahahahahah as soon as I saw Kazzak's image I was like "oh he and mucky go waaay back"
Is Kazzak still in the game? I remember flying through HFP during my brief stint in Cataclysm thinking I could reconnect with my old buddy, but he wasn't there. Also, I love that they added a daily quest that had people running around that area. Even better, one of those quest mobs was actually linked to Kazzak. In other words, if anyone tried to pull that mob, I could aggro Kazzak on my flying mount, then he would de-aggro and go after that player. If anyone was using heals in the vicinity, Kazzak killed them too. Kazzak went from spamming the zone with shouts, to spamming the zone with shouts and occasionally going on a killing spree. I'm pretty sure someone at Blizzard just kept saying, "C'mon man, it'll be funny!" Mucky wrote: All hours? Try all seconds. 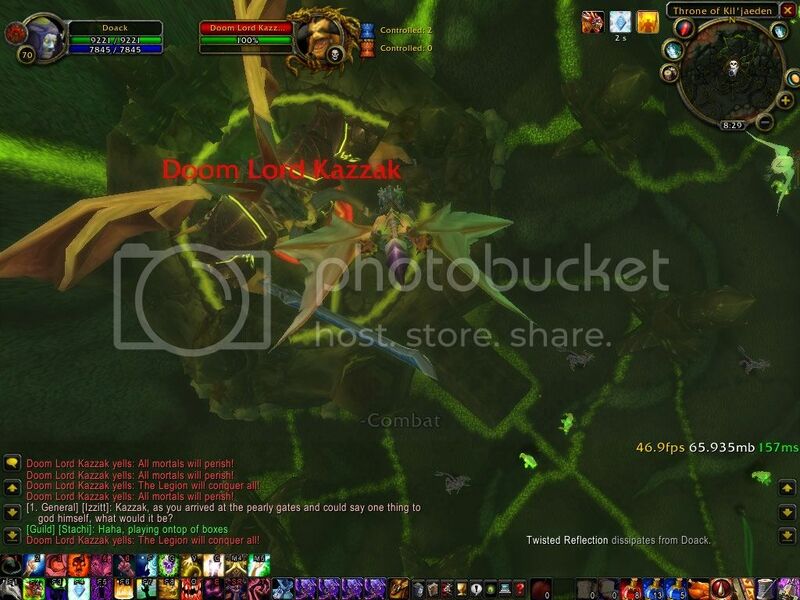 Mucky wrote: Is Kazzak still in the game? I remember flying through HFP during my brief stint in Cataclysm thinking I could reconnect with my old buddy, but he wasn't there. I'm pretty sure he's still in game, I didn't see anything to suggest otherwise anyway, but with the higher levels and rescaling, its probably a lot easier to take him down now. I imagine that he might have just been waiting to respwan. This weekend has been stolen by the Defias Brotherhood! "None may challenge the brotherhood." Edwin VanCleef was the son of a stonemason. While he learned his father's craft, young Edwin found that a life of crime would be far more lucrative. That proved to be the case until the reconstruction of Stormwind, following the end of the Second War, made stonemasons much more valuable than rogues. As a master of his craft, Edwin VanCleef soon found himself in charge of the reconstruction of Stormwind Keep and much of the city. With the work done, Edwin expected that he and his fellow members of the stonemason's guild would get fair compensation for their work, only to discover that the Council of Nobles intended to pay them only a pittance of what was promised. In frustration, VanCleef instigated a riot, which only resulted in the accidental death of the Queen and the expulsion of VanCleef and much of the stonemason's guild from the city. 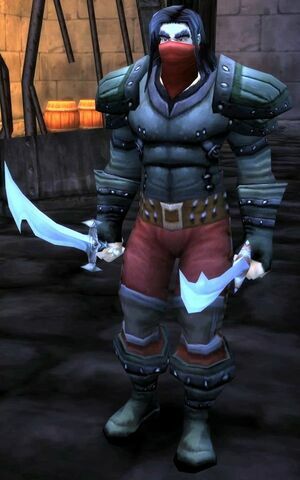 Like any good labour leader would do, VanCleef organized his group of exiles into a secret brotherhood of thieves bent on revenge for the wrongs committed to by Stormwind. This included taking over several mines, farms, and even the entire town of Moonbrook, all while refurbishing an ogre juggernaut left over from the Second War to unleash on Stormwind itself. VanCleef didn't live to see his dreams of revenge did come to fruition. He was killed by adventurers, and his head taken as proof of the deed. His dreams of revenge would not die with him, however, as his daughter, Vanessa VanCleef, swore to avenge his death at the hands of agents of Stormwind. 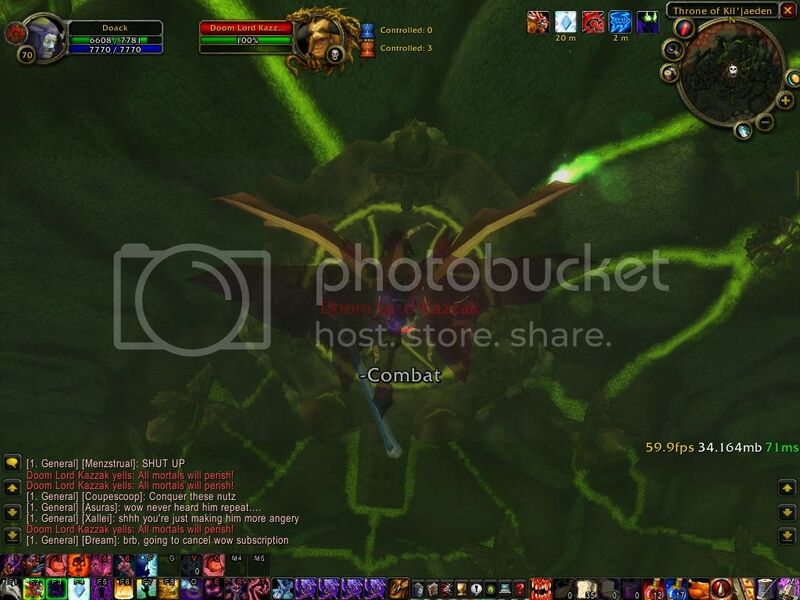 Mucky wrote: Is Kazzak still in the game? I've played off and on since then and post-BC I've only seen him once in wotlk and that was it. If he still exists he, like the guy in front of BT, is camped by botters. Dropping 500g may be a slight incentive towards that. It's likely that, like all other old content, his gold drop is probably single or two digit now. Only heoric 25 man cata+ stuff really drops a noteworthy amount (and most people for some reason still can't do those lol). "Your treachery only speeds your doom. This world will fall to darkness!" Baron Kazum was one of the four Abyssal Lords, and member of the Abyssal council. Together with his fellow Abyssal council members, he commanded the Twilight's Hammer Clan in Silithus. He is known to be quite upset if summoned by people outside of the Twilight's Hammer Clan. Based on his appearance, Baron Kazum may be a mountain giant who turned his back on his Titan creators, and was lured into the service of the Old Gods. Or, maybe he was an earth elemental noble, and Blizzard used the mountain giant animations as a placeholder. Who knows! The first option seems like a more interesting story, so I'll go with that. Presumably, Baron Kazum was destroyed by adventurers at some point, as he and the Abyssal Council make no appearances in Cataclysm, despite their important relationship to the Twilight's Hammer Clan. He and his fellow Abyssal Lords have apparently been removed from the game. "We will spread across this barren land!" Mordresh Fire Eye was once an orc shaman sent to investigate the Scourge presence at Razorfen Downs. Tragically, he was unable to report his findings, as he was killed by Scourge forces and raised by their leader, the lich, Amnennar the Coldbringer. Twisted into a hideous parody of his previous existence, Mordresh now rallies Amnennar's forces at Razorfen Downs. Mostly that involves dancing on top of a giant pile of bones. Unlike most of our previous characters, the future has been kind to Mordresh. 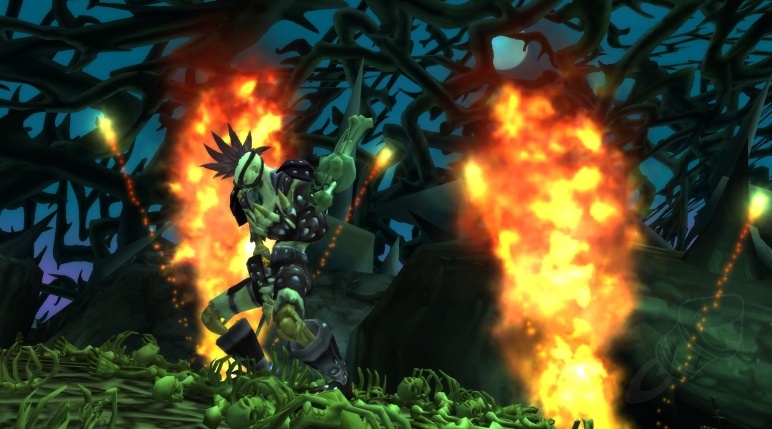 Since the introduction of Warlords of Draenor, he's gained flesh, pyrotechnics, and an Arcanite Ripper. While he might still live in a stinking hole in the ground full of zombie pigmen, Mordresh Fire Eye is clearly winning at undeath. Today we have Emperor Dagran Thaurissan's second favourite pocket healer! "You will not harm Emperor Thaurissan!" The High Priestess of Thaurissan is a thankless job. Offer spiritual advice, heal him when attacked by rampaging adventurers, and know when to step aside when your emperor falls in love with captured foreign princess of an enemy clan. The High Priestess would only appear if players had already completed the quest to "rescue" Princess Moira Bronzebeard, making her more of a part-time sub-boss in the encounter with Emperor Dagran Thaurissan. While still in-game, the entire fight with Emperor Thaurissan, and Moira or the High Priestess sits in an awkward spot in lore and time. Emperor Thaurissan has been killed in-canon by King Magni Bronzebeard's hit squad of adventurers, sent to "rescue" his daughter Moira. Moira has since returned to Ironforge, and now forms one third of a faction boss alongside Muradin Bronzebeard and Falstad Wildhammer since her dad's been turned into a giant crystal statue. So I guess the High Priestess is either dead, or she missed the fight entirely because Moira was there and now lives on in regret of her failure to save her emperor?